If you aren’t familiar with Snapchat, let’s start with the basics. Snapchat is a mobile photo messaging and multimedia sharing app which has been growing rapidly among mobile users (predominantly ages 18- 34). At the end of 2016, it had over 150 million active daily users among which 54 percent log in every day. For more statistics, check out Snapchat by the numbers. Snaps are the posts on Snapchat. Snapchatters are the users of Snapchat. A filter (a.k.a. 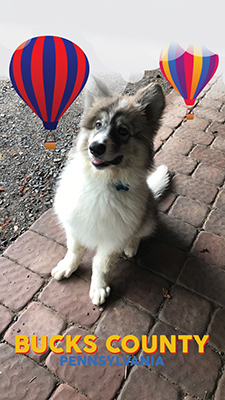 Geofilter) is a photo overlay that changes the Snap photo in some way. A Geofence is a virtual geographic boundary defined by GPS or RFID technology, which enables software to trigger a response when a mobile device enters or leaves a particular area. One of its most popular features – and, importantly, an revenue stream that Snapchat hopes to grow – Geofilters are location-based overlays that Snapchat users can apply to their Snaps. Snapchatters, businesses, artists and designers can submit fun and creative Geofilter artwork which can be used strategically for marketing. A Community Geofilter is one that doesn’t include any branding, business marks/names, or logos, and doesn’t promote a business or a brand. Sometimes called a Personal Geofilter, it can be submitted to Snapchat, for example, to celebrate a birthday, a prom, a graduation, an anniversary or the like. An On-Demand Geofilter is one that promotes a business or a brand, and it will need to meet the Business guidelines set forth by Snapchat. A Geofilter delivered to a national audience will typically be seen by 40 percent to 60 percent of daily Snapchatters. Draw your geofence thoughtfully; it should cover only the relevant area. Select the dates and times that the Geofilter should be active. An On-Demand Geofilter cannot be active for more than 30 days. No photographs of people, hashtags or lotteries. Make sure it's relevant to the location. For additional content restrictions and guidance go to Advertising Policies and Community Guidelines. Have you seen or used any compelling Geofilters lately? Share your Geofilter stories with us in the comments.